Based in Bognor Regis, not far from our South Coast office, Heirlooms Fine Linens is a niche company making bespoke linens of exceptional quality and lasting beauty. Heirlooms works with private clients globally, and has longstanding relationships with the world’s leading yacht builders, executive jet manufacturers, interior designers, property developers and boutique hotels. We were asked to update and develop an existing brand identity. 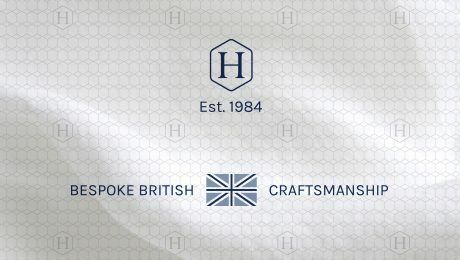 Our brand evolution included introducing the Union flag as a graphic device to promote the company’s British heritage, and creating the Heirlooms ‘H’ monogram to give it a more premium feel. We created a master set of logo artworks to achieve brand consistency across all marketing communications. 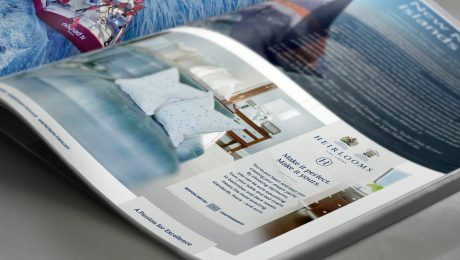 Heirlooms also asked us to design and build a new responsive website. Taking our cue from the linens themselves, we created a crisp, clean colour palette, complemented by classical art direction and minimal copy. The site has a feeling of quality, craftsmanship and intimacy, in line with the company’s products, methods and scale. A background repeat pattern, monogram 'H' and Bespoke British Craftsmanship device were created to add ownership to marketing communications in print, pixel or thread. Applying the brand assets to online and offline advertising.